Things are different in Bay View these days, and there might not be a better example of that than a tattoo-shop-and-laundromat being converted to high-end apartments. 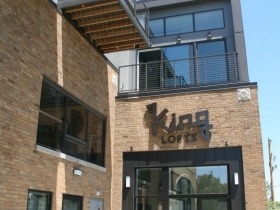 Led by developer Scott Genke, the King Lofts is a 14-unit apartment project in a converted building on Bay View’s main street, S. Kinnickinnic Ave. The project draws its name from the building’s original use as the Jim King Chevrolet car dealership. The car dealership is long gone, but the place has been known as the King Building for years. Opened in 1929, the building most recently had a number of commercial tenants, with an awkwardly inserted office space on a second-level with low ceilings. Genke’s firm SG Property Development + Management has renovated the structure, removing the office space level and adding a true second-floor. The new floor will take the building from 24,870 square-feet to approximately 32,000 square-feet. Two commercial spaces still face S. Kinnickinnic Ave. in the building, but they’ll have drastically different tenants than before. The northern stall will soon be home to the Deco Salon & Spa, a new hair salon whose name is a nod to the building’s art deco design. The 2,500 square-feet salon will be owned and operated by April Podawiltz. The southern stall is of similar size and is being converted to a white-box restaurant space. The restaurant stall includes a patio that faces the Milwaukee Public Library‘s Bay View Library branch just to the south. At the time of my tour Genke didn’t have a signed tenant, but has had inquiries. Behind the commercial spaces on the first-floor are five live-work units. The units include an amply-sized one-bedroom apartment and an additional work space that fronts an interior hallway. One unit has already been leased to a tenant who will open a pottery studio in the live-work unit. That unit also includes a special basement space with direct stairway access, perfect for storing a kiln. 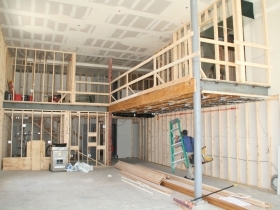 The building’s new second floor includes five one-bedroom apartments, and four two-bedroom apartments. 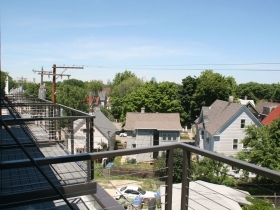 Every unit has at least one balcony, with the two units facing Kinnickinnic featuring a second, large balcony. The apartments in the rear of the building have impressive balcony views due to the building’s location, with the skyline and Bay View’s wind turbine visible. One parking stall per residence is included in the building’s basement. 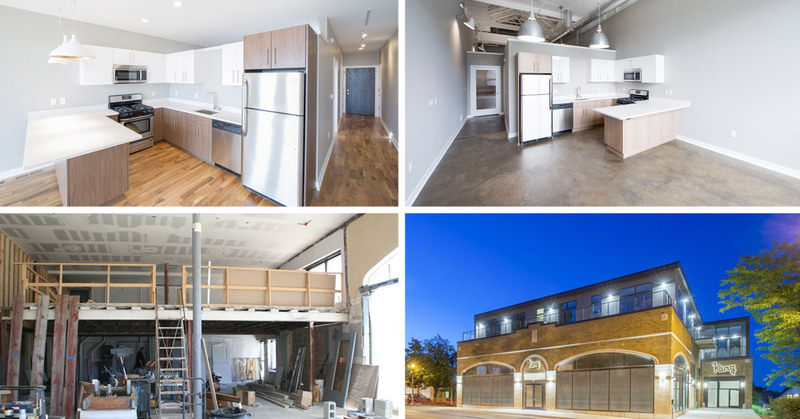 Unlike many adaptive reuse projects that have to shoehorn parking into a low-ceiling basement, the basement at the King Lofts is well-suited for parking. Owing to its origin as a car dealership, the basement was built to store vehicles. Looking to move in? Rents for units in the building range from $1,295 to $1,795. Occupancy starts July 1st. The project website has more information on leasing options. Genke acquired the building in 2014 and construction got rolling in 2015. He originally proposed adding four floors to the top of the building in 2014, but later scaled down the proposal after studying the amount of available parking and other design factors. 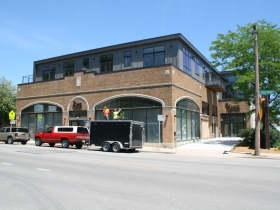 The energetic developer, whose firm SG Property Development + Management owns approximately 50 units in Milwaukee, was able to relocate The Ink Spot Tattoo Studio into another building of his at 2505 S. Howell Ave. The tattoo parlor joins Rev Pop, a yoga studio and guitar store in a collection of mixed-use buildings Genke owns on S. Howell Ave. The diverse collection of tenants and focus on mixed-use properties is a cornerstone of SG’s tagline of “Building Community.” True to that tagline, Genke will become part of the community and move his office into a space in the rear of the building. Gallus Architects served as the project’s architect and Campbell Construction provided general contracting services. Genke has his eyes set on two projects in the near future. 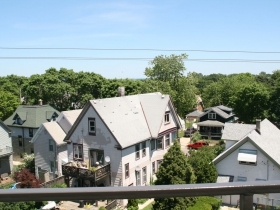 He intends to build two apartment projects, one in Bay View and one in Riverwest. The Bay View project would be built at 2557-2565 S. Kinnickinnic Ave. City records indicate Genke’s firm SG Property Development acquired the two adjacent lots totaling 15,000 square-feet earlier this year. Both lots are currently vacant. The Riverwest project would be built at 2764 N. Humboldt Blvd. Genke acquired that site in September. A different firm previously attempted to develop an eight-unit project at that site, and Genke is planning to do something similar. City records have the vacant lot recorded at 12,539 square-feet. Both projects are being designed by Milwaukee-based Johnsen Schmaling Architects. Looks like they are selling kitchen appliances. Tom, I agree except I would say its the last day of a liquidation sale right before they shut the place down. Architecture and design have really seemed flat lately. It just seems like the less you have with these places the higher the cost will be. Soon it will be a single white box studio with a community bathroom for $2000.00 a month, but they’ll include your membership to the cat yoga studio in the lower level and there of course will be a craft brewer 2 blocks away. Good to see the progress but I’m just bored with the design. I’ve toured these units and they are anything but simple white boxes. Solid Hardwood floors throughout living areas with polished concrete and high end ceramic tile elsewhere. Two piece solid wood base. Pella sliding doors, high end light fixtures. The drywall was perfectly finished which is really hard to find in contractors. The details were just impeccable. This project is definitely outside the box. Too much road noise and carbon monoxide for the rent level. “high end” units. Personally, I don’t know anyone who can afford $1,300 for rent. I should add that in a mature and healthy neighborhood, there should be a mix of newer units and older units, providing housing for a range of incomes. I realize that may not be the case, especially in neighborhoods that have not had much residential development until recently. I just toured the King Building units this morning with owner Scott Genke. As current president of KK BID 44 I am quite interested in every development within our borders as well as the rest of Bay View. Scott was the designer on our Sheridan’s and Sheridan House development in Cudahy, so one might suggest I am a bit biased. I am but “only” because Scott is very detail oriented and his work is always of high quality. The King development is exactly what we want in Bay View. Scott’s building is a great blend of the old facade and the modernization a business owner or resident looks for today. I own The Avalon Theater and renovation that makes sense within the historic context as well as the economics of a building are important for Bay View. I believe our wonderful patrons would attest to the fact that we worked hard to keep The Avalon a restoration we can all enjoy. However, many buildings don’t make sense for complete historic renovations. 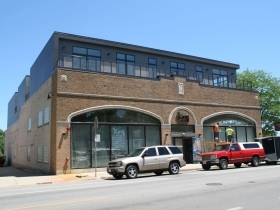 I am also a fan of the buildings SG Property has renovated on Howell and in residential parts of Bay View. Great that we can look forward to another development under Scott’s care at 2557-65. Kudos, Scott!